Our cosmetic dentist, Dr. Robin Rutherford, and our excellent, highly skilled dental hygienists offer comprehensive care for patients with periodontal (gum) disease. Beth Smith, RDH and Dana Eubanks, RDH each have more than 20 years experience and are leaders in their profession. Gum disease, known as gingivitis in its early stages, can cause bad breath, an unsightly smile, loss of teeth, and—if left untreated—serious health problems like strokes and heart attacks. To prevent the disease from progressing, it is important to understand what causes the problem and how to treat it. Gum disease, also known as periodontal disease, is a serious inflammatory condition that develops around a tooth due to a bacterial infection. The disease can affect as few as one single tooth to every tooth that is present in the mouth. Warning signs of gum disease include red, swollen, bleeding gums and bad breath. If the condition is caught in its early stage, known as the gingivitis, Dr. Rutherford can repair the damage. However, if it is left untreated, the disease can turn into periodontitis—the most severe form of gum disease that leads to bone and tooth loss as well as systemic problems. Fortunately, Dr. Rutherford offers several dental procedures that can not only slow the progression of gum disease, but restore your healthy, beautiful smile. Periodontal disease is caused by bacterial plaque or biofilm—a sticky, colorless film that is constantly forming on your teeth. This toxic bacteria attack the soft tissue and bone around the teeth, leading to gradual recession and eventual tooth loss. This same bacterium has also been found in the plaque that blocks arteries. This evidence suggests that the oral bacteria causing gum disease may be related to coronary heart disease. In addition, COPD/ lung disease, arthritis, stroke and diabetes have been associated with bacterial infections in the mouth. This makes it even more compelling to control the pathogens present in gum disease. Tobacco use is linked with many serious illnesses. However, most people do not know that using tobacco also puts you at risk of periodontal disease. It is a significant factor in the development as well as progression of periodontal disease. If you smoke long enough, the chances are very high that you will lose your teeth to gum disease! Stress can make it even more difficult for the body to fight off serious infections as well as try to fight off periodontal disease. Having diabetes puts you at a much higher risk for obtaining infections, which includes periodontal diseases. These infections can decrease the ability to process or utilize insulin in the body, which can cause diabetes to become more difficult to manage and the infection to become more severe than to a non-diabetic. Millions of Americans have diabetes and many others have not been properly diagnosed. Some people may be up to six times more prone to developing periodontal disease, even with proper oral care. Genetic testing can be done before they even show signs of periodontal disease. Identifying and getting them into early interceptive treatment may help them with a lifetime of healthy teeth. Although brushing, flossing daily, regular exercise and a healthy diet are essential during life, there are definite times during a women’s life that additional care is necessary. Such times would be puberty, pregnancy and menopause. During these times, a woman’s body experiences a lot of hormonal changes that can and will affect numerous tissues in her body, as well as her gums. The gums will react more strongly to her hormonal fluctuations making her further at risk for periodontal disease. In addition, current statistics suggest that pregnant women who have periodontal disease are seven times more likely to deliver preterm babies that have low birth weight. A number of drugs such as antidepressants, oral contraceptives, and certain heart medications can influence a person’s oral health. It is important to inform your dentist of any and all medications that you are taking as well as any changes that have occurred in your overall wellbeing. What Gum Disease Treatments Are Available? Sometimes it is necessary to prescribe antibiotics to get rid of certain bacteria that cannot be removed during gum therapy. A simple diagnostic test will give valuable information to your dental clinician for the assessment and treatment of gum disease. Laser dentistry has a detoxifying effect on gum disease, which is why it is advantageous in periodontal therapy. During a non-surgical laser treatment, a hygienist removes any debris and calcified deposits from teeth, and a laser is used to selectively remove diseased or infected tissues lining the pockets around your teeth. At the same time, the laser will kill bacteria that cause gum disease and promote healing of your gums. The bacteria-killing effectiveness of the diode laser has been well-documented. It has shown to significantly slow the dangerous bacterium that is associated with aggressive gum disease. This bacterium is not only on the diseased root surface, but it also invades the nearby soft tissues, making it difficult to remove by mechanical instrumentation alone. In the past, this has often made the use of antibiotics necessary. However, the diode laser provides a non-antibiotic solution. 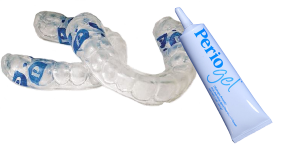 Perio Protect® is a non-invasive method of treating gum disease. This innovative system requires patients to regularly wear a Perio Tray® between routine dental cleanings to help prevent their gum disease from progressing. The device is designed to deliver medication below the gums. It resembles a mouth guard but has a special seal to effectively reach the pockets between the teeth and gums where a toothbrush, dental floss, and mouthwash typically cannot reach. The Perio Tray® is custom-made to the dimensions of your mouth to ensure a proper and comfortable fit. This seals the tray to your gums, creating pressure that pushes the medication beneath the gum line. The device should be worn anywhere from one to three times daily for approximately 10 to 15 minutes each. This allows the medication to fight bacterial infections while encouraging the gum tissue to heal. The specifics of your treatment will depend on your unique needs and will be discussed with you during your appointment with Dr. Rutherford. This exciting treatment can often prevent the need for gum disease surgery in the future, as it helps stop gum disease from getting worse. With consistent use as directed by Dr. Rutherford, you can keep your condition under control and protect your oral health for the future. If you are showing signs of gum disease, or would like more information about periodontal therapy, please contact The Art of Dentistry to schedule an appointment with Dr. Rutherford.